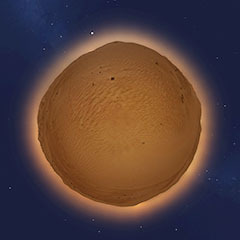 A Stellarium[a] landscape I made from a panorama I shot while on a desert safari in the Dubai Desert Conservation Reserve. The landscape has plenty of atmosphere along the horizon. This is intentional. It is for Stellarium 0.12.4 or later (works great in 0.13.x), as it is made with a fixed light level. If used during simulated day it will look strange. Please see the accompanying readme.txt for installation instructions.